The July solicitations for Dark Horse Comics are now available on Comic Book Resources. With July’s update we get our first look at the covers and synopsis for Aliens: Defiance #4, Prometheus: Life and Death #2 and Predator vs. Judge Dredd vs. Aliens #1. Beware some story spoilers! 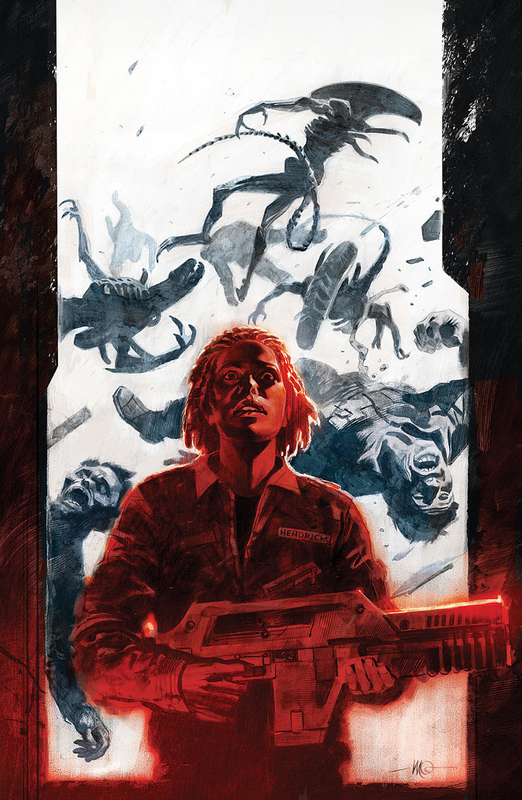 Massimo Carnevale’s cover art for Aliens: Defiance #4. 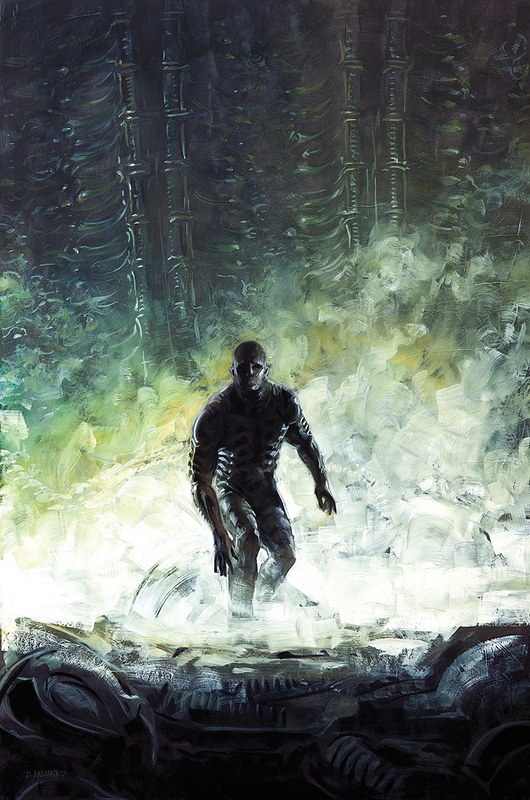 David Palumbo’s cover art for Prometheus: Life and Death #2. Prometheus: Life and Death #2 is due July 13th. Aliens: Defiance #4 and Predator vs. Judge Dredd vs. Aliens #1 is due July 27th. Thanks to Ultramorph for the news. As things currently stand, there's no Big Deletion. The stories involving Aliens in the timeframe between Alien3 and Resurrection are currently confined to a small group of people on one planet, most of whom are dead. If there was a Big Deletion post Resurrection (putting aside that such a thing would be redundant), surely Liliya would have either been affected or at least know about it? I've been awfully confused, so there should only be two different coloration's for this series, the original and the one you posted. For some reason Xenopedia had me thinking the series had been completely recolored already in the late 90's. Same panel you posted earlier, I do believe. That is definitely the way better, do you have a pic of the original coloring of that page? Or is the one I posted the original color? Avp classics version and avp war pic added. I liked the golden Pred helmets That aside, and going a tad off subject, does anyone else have the feeling xeno's are going to be invading earth in Lebbons upcoming novels? If thats true, it could potentially legitimise any past comic that references the Alien takeover. Unless said comic referencs a xeno homeworld or xeno zip/royal jelly. It really needs to happen! I've been asking for it for 6 years now! It needs to be completely recoloured with modern techniques and released in the same style of hardcover that fire and stone and the 30th anniversary edition of the original Aliens comic has been. Not to go off topic but speaking of AvP, I've always had the DH classics 6 issue re-run of the series from the late 90's. Only recently have I noticed that the coloring is different in all these pics from AvP in the omnibus and in the original run. Am I crazy or did they actually do a recolor for the classics 90's run? Can anyone confirm that? It doesn't match the reprint that came with AvP 2010 either, which looks great BTW. According to xenopedia it was recolored. For the six-issue re-run, the story was recolored by Chris Chalenor and In-Color and re-edited by David Land. The cover artwork by Michael Dubisch was also created for the release. i didnt like the coloring in this version much either. But it must be more consistent that in the original version. Anyone read Dark Horse Presents #146? Picked that one up last year and was pleasantly surprised by the link to the original Aliens vs Predator series. What is the connection dude? I shamefully have not read it. Robert Sheldon. The young boy who survived the first Predator attack on Ryushi. Oh nice. Thanks dude. What's the general premise ? I have AvP Web pt1, never picked up or read part 2. Was not prepared for such a dark ending My jaw was literally dropped when i finished! Ah, yes! Sorry I thought it was a new one for some reason. I'm very fond of The Web! Defiance #4, Prometheus #2, and Predators vs Judge Dredd vs Aliens #1 are all live for pre-order on TFAW. Out of curiosity, does Smiley survive? What happens at the end? All I know is that humans got trapped on the world thanks to Smiley and his clan. But have no idea what the plot is. Smiley does live at the end... dragging what I assume is the Queen's bludgeoned body. Just got my copy of The Weyland Yutani Files today!! No mention of Colonial Marines! Hah! Take that Gearbox! Also won an auction for a Palisades Queen Chestburster replica at a great deal! Damn today was great!! Civilized Beasts was surprisingly fantastic. Even more so when you consider how lackluster Thrill of the Hunt was. Regardless of references to the Big Deletion, Civilized Beasts is a solid, enjoyable comic with good action and pacing. The Big Deletion is explained in Thrill of The Hunt. Hehe, It's not like I do either ! Thrill of the Hunt also attempts to explain the inconsistencies between the existing Aliens and Aliens vs. Predator comics and the film Alien Resurrection, in which General Perez states that the Xenomorph species has been extinct for the last 200 years — a fact that contradicts the comics, in which humanity had repeated interactions with the Xenomorphs in the interim, and the Earth itself even became infested and ravaged by the Xenomorphs, a monumental event that would take humanity close to a generation to recover from. The principal way in which the comic attempts to clear up this inconsistency is through the introduction of "The Big Deletion": a galaxy-wide computer virus event which, it is explained, wiped out most of the extrasolar human colonies and much of the electronically stored information about mankind's past. Did Thrill of the Hunt or Civilized Beasts introduce the Big Deletion? Yeah i always wondered why dark horse continued to reference earth being taken over with comics like Three World War which was ridiculous and went nowhere. The comics where Aliens took over earth or were even mentioned taking it over were considered non canon as soon as Alien 3 made its debut. The rewrites were considered non canon after Resurrection and especially after Prometheus. Prometheus taking away the Alien homeworld and making the pilot race into engineers. Now my Alien/Predator comic box is set up to be canon friendly, so to speak, with the Alien and Predator cinematic universe. Anything Predator takes place from the past to now. Predator featuring Dutch's brother doesn't fit as its never mentioned in later movies. Something like Aliens Earth Angel fits because its an isolated incident that wasnt documented by anyone. Aliens vs Predator set on Ryushi fits before Aliens as it ends without anyone even bothering to really investigate the incident. Same with Avp Duel which can be set almost immediately after Alien 3 AND of which legitimises quotes from the Colonial Marines Technical Manual. With that in mind, "the company" was pretty much forced by Colonial admins and the military alike to forewarn its colonies of the XT threat. Only higher up's having the facts leaving regular joe's passing along rumors. Lets not forget also about company cover ups such as Aliens Berserker. After Avp War, which brings Predators into the spotlight, We get the Fire and stone series which also isnt documented by anyone. Counting the big deletion as canon fortifies the fact that the military barely knew what xeno's were and where to find them. With Predator Incursions inclusion of another research vessel experimenting with xeno's a few years before Resurrection, i'd say its a solid fact General Perez was one of possibly a few army stooges with orders to investigate rumors of past xeno incidents and collect specimens if found. Perez getting lucky and finding Ripleys tissue samples on Fury. In short, if the incident isnt well documented or can be considered a cover up, it fits perfectly before Resurrection. Now, as Incursion states, Xenos and Predators are well known in the new farther future so anything where people mentioned Aliens as if the whole of humanity already knew fits perfectly in that timeline. Questions? Problems? Lots of problems, but i'll just point out that Dark Horse was still considering the infestation of earth canon to the EU as late as 2009, when Aliens:More than Human was released, which specifically references earths infestation. Just finished the 2nd issue of Life and Death. Contrary to the first issue, this one felt balanced in both action and universe construction, if that's what you'd call it. The single problem I have now is that the artwork seems to go downhill, but that might be just me acquiring some new tastes. They did starting with fire and stone, the comics we are talking about "Civilized Beasts" which started the idea of the big deletion, this was before the reboot when earths infestation was still apart of the EU. i don't think the old comics are still considert canon. they started fresh just like star wars did it. You seriously count xenos taking over earth as still being canon? Not at all. But the comics do, and it's the comics that came up with the Big Deletion to try and explain away how no one in the films remembers that happening. You seriously count xenos taking over earth as still being canon? Theres just so much wrong with that. Then again fox only counts the movies(not avp?) and current comics and novelization to be canon so any argument on the matter of whats more stupid than the other is really pointless when it comes to anything not branded as canon by fox. All we as fans can do is decide for ourselves and live happily in our own universe's in the end. The big deletion fits perfectly in that universe alongside ideas like predators teaming up and becoming best buds with humans in a franchise where they hunt them for sport. No. The Big Deletion is a strong contender for the dumbest thing to ever come out of the franchise. Like 420Buddy says, it doesn't even make any sense on it's own terms, because the USM still know all about what went on with Ripley... but none of the other hundreds of Alien encounters that happened in the interim. Including all of Earth being taken over.